When it comes to my barbeque, I’m an Eastern North Carolina purist. I believe that the hallowed pulled pork meat should only be basted and sauced in a vinegar and red pepper sauce, and nothing anyone says will convince me otherwise. When it comes to other forms of slow cooked meat, however, I’m a little more open. For instance, on my pork ribs I love nothing more than caramelized brown sugar and a heavy dose of cayenne. Recently I spent a day in Raleigh with my Great Uncle Ted and his wife Ann, my great aunt. Ted is my grandmother’s brother, and we were talking about his childhood growing up in Wake County for the Tasting North Carolina series. We talked about our family, his parents and their families, his favorite foods, and his life growing up in North Carolina. We decided on a pound cake recipe from his mother, Flossie, for Wake, but he also shared his famous rib sauce recipe with me and it was too much to pass up. When I make ribs I usually do a spice and brown sugar dry rub and allow the sugar to melt and the spices to blend with the smoke from the grill over the course of many hours. Finished with Ted’s sauce (adapted to make it a bit spicier), the ribs were sweet and smoky, crisp and saucy, melt in your mouth perfection. 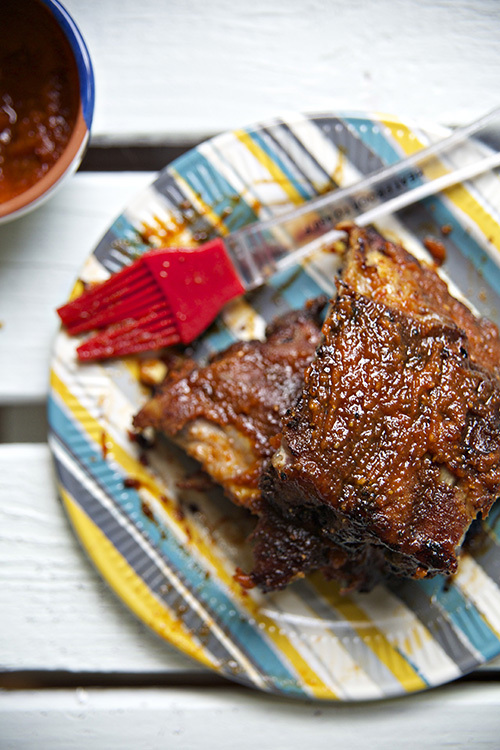 Since we made these a few weeks ago I’ve been wanting ribs all day, every day. I even convinced Dan that making them on a Thursday was totally reasonable even though it meant eating at midnight. I would say that he’s a trooper but, come on, he got ribs. Heat your grill to approximately 325F. Mix together brown sugar and spices of dry rub. 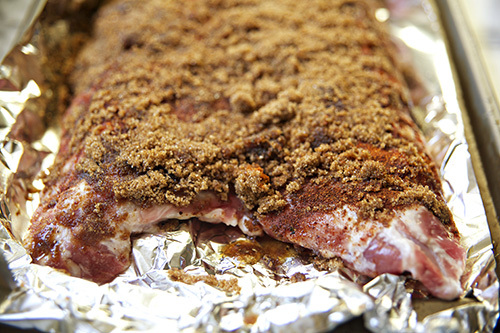 Wrap a baking sheet in tin foil and place the ribs meat-side up. Rub half of the sugar and spice mix into the meat and then flip over so the meat is touching the pan. Top the bone-side of the ribs with the remaining sugar/spice mix. Cover loosely with tin foil and place on the grill. Grill 3-3 1/2 hours or until the meat has shrunk away from the bones and easily peels off. 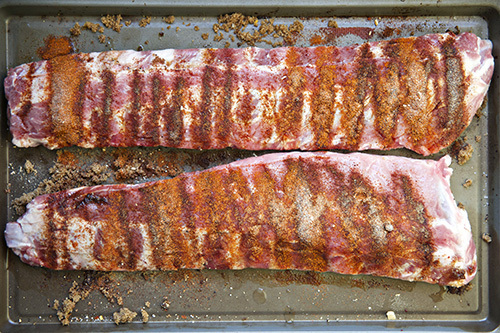 While the ribs are cooking combine tomatoes, sugar, spices, and lemon juice in a sauce pan. Simmer over low heat, stirring occasionally, until ribs are done. 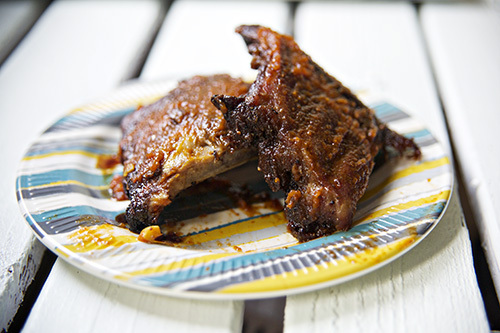 Transfer ribs to a plate and top with rib sauce. Serve hot. Absolutely love how you flavored these ribs, they look and sound incredible! I’ll have to try this, seems like they should be tasty!